While there are a lot of companies out there that will happily sell you cold-brew coffee kits, I make mine in a Tupperware cereal container. Really. There's a picture of it above. 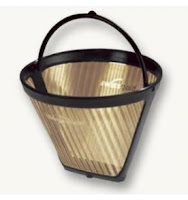 Once it does the 12-hour soak (more on that below), I first strain it into another container using a metal colander to get out the big pieces of ground coffee, and then re-strain it using a standard wire-mesh coffee filter, as illustrated below. I store it the final product in a big Tupperware juice container in my fridge. I want to try straining the mixture with cheesecloth at some point, to see if that works better than my comparatively small gold filter. You are making concentrate, not coffee! While most cold brew recipes say to use coarsely ground beans, my experimentation so far has led to better results with more finely ground coffee. The batch I tried with coarse beans led to weaker concentrate, and I had to use a 2/1 ratio in terms of concentrate/water dilution. When I use fine grind, it's more of a 1/1 ratio - or half a coffee mug of cold brew and half a coffee mug of water and cream and sweetener. But however you make it, just remember that your final cold brew product isn't meant to be consumed at full strength ... unless you really like coffee flavoured battery acid. But, hey, it's your cold brew. Experiment. See what you like. Most recipes say to soak the ground coffee for 12 full hours. But a lot of the comments I've seen on recipes say that makes the cold brew too bitter. Honestly, I haven't done a 12-hour soak yet. My first test batch was something like six or seven hours and it was darn near perfect. Since then, I've been averaging around 10 hours, but, like above, experimentation is key. "Cold brew" is actually "counter brew"
Yeah, don't put the soaking ground coffee in the refrigerator. Just leave it on the counter to steep overnight or while you are at work. Strain it and then put it in the fridge to chill. If you have any cold brew tips, feel free to leave in the comments. There are 2 ways to extract flavor from ground coffee: heat or time. 20 hours in cool water is the key to our #ColdBrew. Further to the last couple of points, Starbucks tweeted recently that they do their cold brew for 20 hours in cool water, so I made my most recent batch of cold brew in the fridge and let it sit for about 22 hours (give or take an hour or two) and it turned out quite fine. I'd almost want to do a side-by-side taste comparison between "counter brew" and "cold brew" but both have worked out quite well for me.